Made from an ultra-durable, water-resistant 500D nylon, the 5.11 TacTec™ Plate Carrier Vest is uniquely designed to give the wearer an increased range of motion with a lightweight feel and optimal breathability. 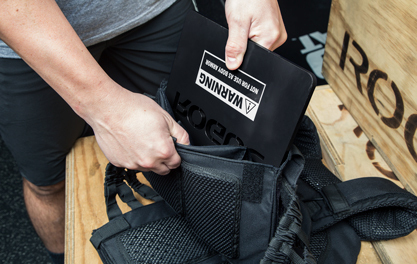 Unlike some comparable weighted vests or flak jackets in the industry, the 5.11 Tactical Weight Vest can hold medium and large ballistic plates—front and back—without the restrictive bulkiness. Yoke shoulder pads reduce friction, adjustable tensional bands improve stability, and innovative air flow channels and aerospace mesh ensure sustained comfort. 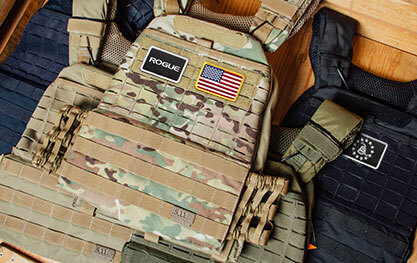 The 5.11 TacTec Plate Carrier Vest weighs 2.5LB on its own, and can be ordered as part of a package with a set of compatible plates—including your choice of the original Rogue Vest Plates or our new USA Cast Weight Vest Plates (you can compare options below). All weight vests come with durable Duraflex® hardware, a laser-cut micro-loop web platform, and an extended drag handle and quick release system. Important: The 5.11 Tactical Vest is intended strictly as a fitness accessory and should NEVER be used as body armor. An athlete doesn’t need to sacrifice comfort or mobility to get all the benefits of a top-tier weighted vest. 5.11 Tactical has created a uniquely lightweight and body-contoured plate carrier, weighing just 2.5LB unloaded, and capable of holding both medium and large ballistic plates, front and back. The carrier is made from durable 500D nylon, and features yoke shoulder pads to reduce friction, adjustable tensional bands for stability, and innovative air flow channels for sustained comfort. Along with the original standard black, the 5.11 TacTec Vest is also now available in Tac OD and Camo (for an additional $30). You can select your preferred color, as well as a wide range of optional Rogue badge attachments, via the dropdown order menus. 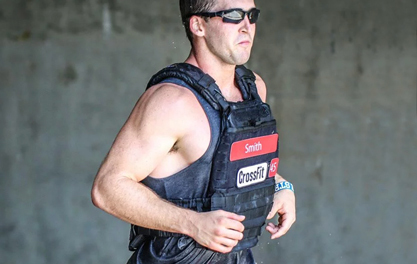 5.11 has been the official plate carrier provider to the CrossFit Games for several years, and is trusted by some of the world’s most accomplished athletes for its reliable performance, durability, reduced bulk, and overall comfort. The 5.11 TacTec Vest is also compatible with any other standard 24MM wide Medium (12.5" H x 9.5" L x 2" W) or Large (13.25" x 10.25" x 2.25") SAPI plates (Small Arms Protective Insert). You can follow the process of your package online via the Rogue Shipping Tracker. 5.11 TacTec Plate Carrier is rated 4.9 out of 5 by 198. Rated 5 out of 5 by bsch from Loved it! Top quality The vest was well worth the money. The quality and comfort was second to none. Unfortunately, it was stolen from my vehicle after wearing it for one workout. Hopefully they didn't think it was a bullet proof vest. I'll definitely purchase another one in the future. Rated 5 out of 5 by inked_irishmen from Everything you need in a plate carrier ! I had this for a while now and added two 15 pound plates for front and back. These will kick your training into the next stage and give you more of a challenge. I would highly recommend not going with the cheaper plate carriers you might run across. This kit from 5.11 comes with great features and ultra banded shoulder straps and plenty of molle for anything you might need to add to the kit. The adjustable in this unit makes it perfect for a wide range of users and will keep the kit close to your body for it's not bouncing on your shoulders and off your chest and back. I debated buying a cheaper model of plate carrier before buying this one but like they say you get what you pay for and with this unit you will not be disappointed in the slightest. Rated 5 out of 5 by Ricky08 from Comfortable, Secure and Great for Hikes I bought this for Murphy workouts, hiking and stairmaster. Great product, I also hook my dogs leash to the front of it when I take him on hikes. Also, love the front pocket! Rated 5 out of 5 by AnneDFW from Great piece of equipment! I bought this for my husband for Valentine’s Day and he loves it! He’s 6’1 and 270 and it fits him perfect! I do recommend watching the YouTube video on how to adjust it though and I recommend buying the cast plates not the laser cut! Great product!! Rated 5 out of 5 by rivermra from Super Comfortable I bought this item a few weeks ago and have used it 3 times so far. The plate set up is a little tricky at the beginning but you only set it up once and you're done. The plate carrier fits to your body and it molds to it. It doesn't move, bounce or impedes your overall movement in doing push ups, running, squatting or climbing (you basically don't feel it while moving). Of course, you're heavier (not bulkier), but that's the basic purpose. I greatly recommend it as a way to go beyond and squeeze the workouts to the limit. I believe it's a little pricey but the comfort is great and fitting is excellent. This is something necessary only if you want to go above and beyond or reach competition level. Rated 5 out of 5 by Doncredible from Best plate carrier After reviewing all reviews on YouTube. This plate carrier was and is the best option. In training it will stay firm on the body. And the weight is evenly divided in the back and front.